What does it mean to major in art? Students who major in art are creative thinkers who visualize the world around them to create contemporary and conceptual works of art. 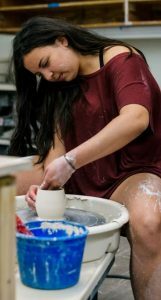 Students choose between a more flexible Bachelor of Arts degree that allows greater compatibility with other areas of study or a more specialized, pre-professional Bachelor of Fine Arts with an emphasis in ceramics, graphic/web design, imaging arts, painting, printmaking, or sculpture. Admission to the Bachelor of Fine Arts program is by competitive portfolio review after completion of 18 hours of studio art courses. BFA students create a senior exhibition to demonstrate a cohesive body of work for their portfolio. No matter the degree path, art majors expand their knowledge of art foundations, develop their natural talents, learn how to promote their art, and become adept at new technologies. Why is the University of Mississippi a good place to study art? 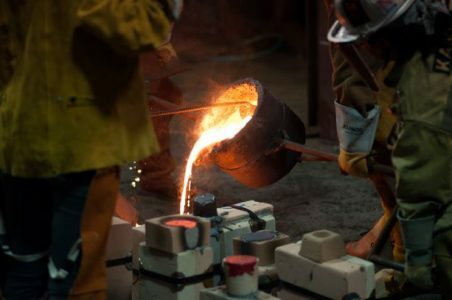 There are 9 faculty in the foundational courses and the studio areas of ceramics, graphic/web design, imaging arts, painting, printmaking, and sculpture. The department provides outlets for student involvement outside of the classroom through various clubs. 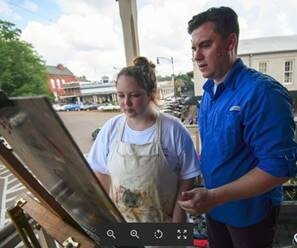 Oxford and the nearby community of Taylor are home to several galleries including Southside and the Powerhouse Community Arts Center. Students have the opportunity to engage in professional activities while in the program. Design students are provided opportunities to compete for logo and identity design contests within the University and in the local community. Art studio students exhibit their work on campus and at local and regional venues. Students may build their résumés and portfolios through internships. A vibrant Visiting Artist program brings approximately 10 visiting artists to campus annually for studio visits, artist talks, and demonstrations that provide students experiences working alongside a wide variety of artists. Professor Philip R. Jackson, Associate Professor of Art and head of the painting studio, received his MFA from Bowling Green State University. He also studied abroad at (SACI) Studio Art Centers International in Florence, Italy. Mr. Jackson is a contemporary realist painter whose work, which takes the common object and elevates it to an object of wonder, has been shown in many national and international juried, group, and solo exhibitions in more than twenty states and is part of several permanent art museum collections. His paintings have been featured in a number of premiere magazines, including Art in America, Southwest Art, American Art Collector, and American Artist Magazine. He is the recipient of many awards including the prestigious Elizabeth Greenshields Fellowship, and international fellowship for representational painting. What can art majors do after graduation? A liberal arts education empowers and prepares students to deal with complexity and change through a broad knowledge of the world. They gain key skills in communication, problem-solving, and working with a diverse group of people. Related careers in art include professional fine artist, educator, graphic design, web design, animation, display/set/exhibit design, art appraisal, production pottery, public relations, architectural modeling, textile design, art therapy, arts administration, museum administration, media buyer, marketing, & interior design. Erin, a transfer student from Jones County Junior College, started her own highly successful wedding stationary business, Luxury Luxe, which was launched to success through social media and later became featured in many top magazines. In this video she discusses the jumping off point of creating her own business. And, Erin’s star continued to rise. 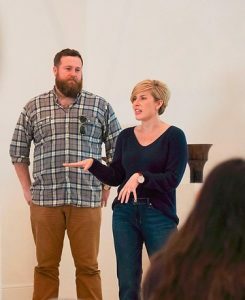 Her creativity got the attention of a HGTV producer, resulting in the hit show Home Town with her husband Ben. On the program, Erin and Ben help residents of Laurel find and renovate homes. In 2016 they also opened the doors of Laurel Mercantile Co. in partnership with family and friends. Whom should I contact to learn more about majoring in art?